While Sahil machine is better known for CNC lathe tuning centre that merit your recognition. 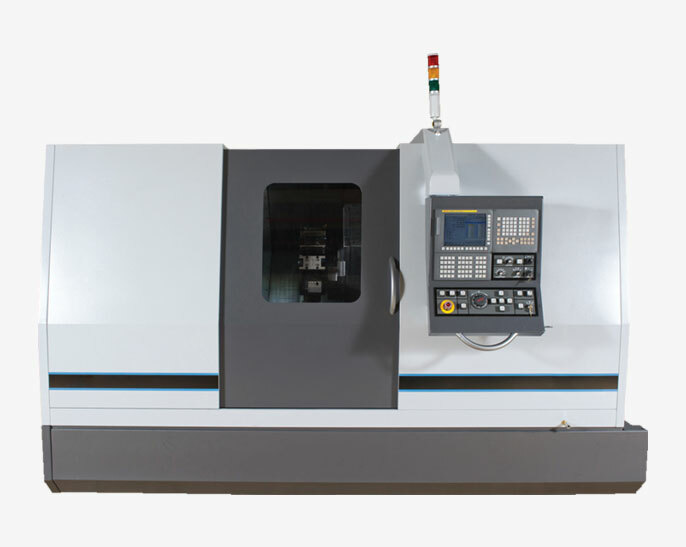 We've resemble the design and development of our CNC lathe centre in the same methodical. These turning centres offer complete complex milling and machining capabilities of medium-diameter bar stock. The machine has a total of 10 axes and capacity for up to 49 tools, with two turning spindles, two milling spindles and two B-axes. These are close –packed and adaptable machines license manufacturers to produce specific, complex parts quickly, with the added benefits of the reliability stability and that is also result from processing the parts on a single machine tool. The main- and sub-spindles of both models feature full continuous C-axes and are synchronized for fast accurate part transfer. The Lathe machines centre has comprehensive tooling system that allows for incredible flexibility in part-making. The CNC machines are fitted in the position of every cutting tool – meaning each tool’s position must be measured during setup. For some cutting tools, like single point tools that perform finishing operations, the tool nose radius must be determined. As with cutting tools, there are some delightful and obvious tasks that must be performed with work holding devices. The chuck used for instance to be mounted on the machine’s spindle and top tooling jaw that must be clamped to the chuck’s master jaws. CNC turning Lathe centre are assembled both vertical and horizontal turnings in a modern factory using the best of raw materials. These machines’ construction allows for superior rigidity and precision, It has extreme outperform and excellent for cutting. Boring bar tool holder x 4 sets. OD tool holder x 2 sets. U-Drill tool holder x 2 sets.